The manorial courts were one step up in law enforcement from the tithings that we looked at last week. 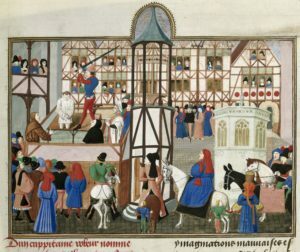 Each manor had a court and the court governed the lives of everyone who lived on the manor, even determining when they could plant and when they could harvest. It fined them if they allowed their animals to stray onto the lord’s demesne, and it was where they took their claims against one another to be judged. The manor was made up of the lord’s demesne as well as the land that he leased to tenants. 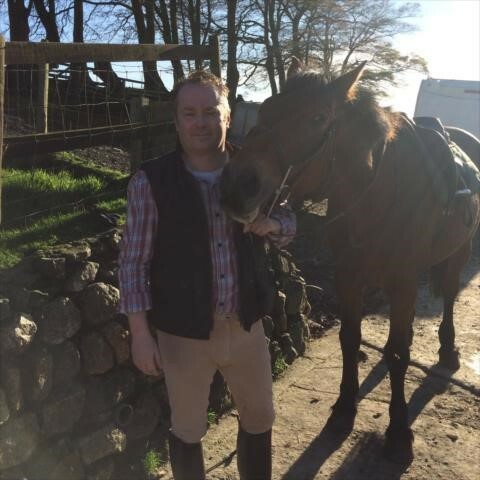 The demesne was the farm that the lord kept for his own benefit. 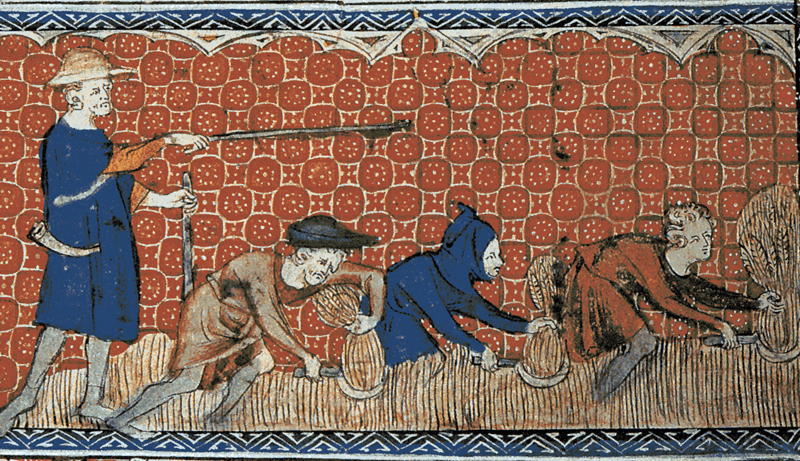 The people who worked the manor’s land were both freemen and serfs (cottagers, smallholders or villeins). 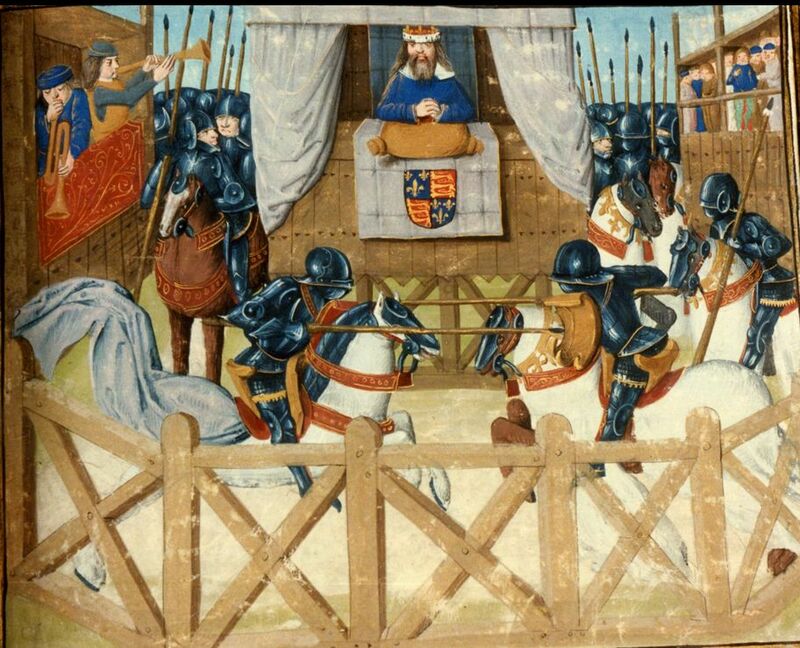 The manorial court dealt with the serfs’ issues, while the freemen were able to go to other courts, which we’ll come to later. It was also able to create new bylaws for the manor. 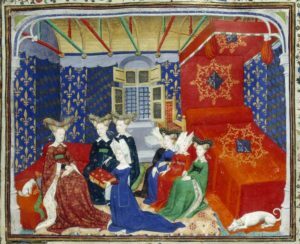 Some lords had more than one manor and could not look after all of them closely, or they were away at war or absent for some other reason. The manorial court was one of the ways in which the manor could be managed whether the lord was there or not. He had a steward, who looked after his interests in his absence, but it was the village officials (reeve, hayward and beadle amongst others) who made sure that things happened as they should. 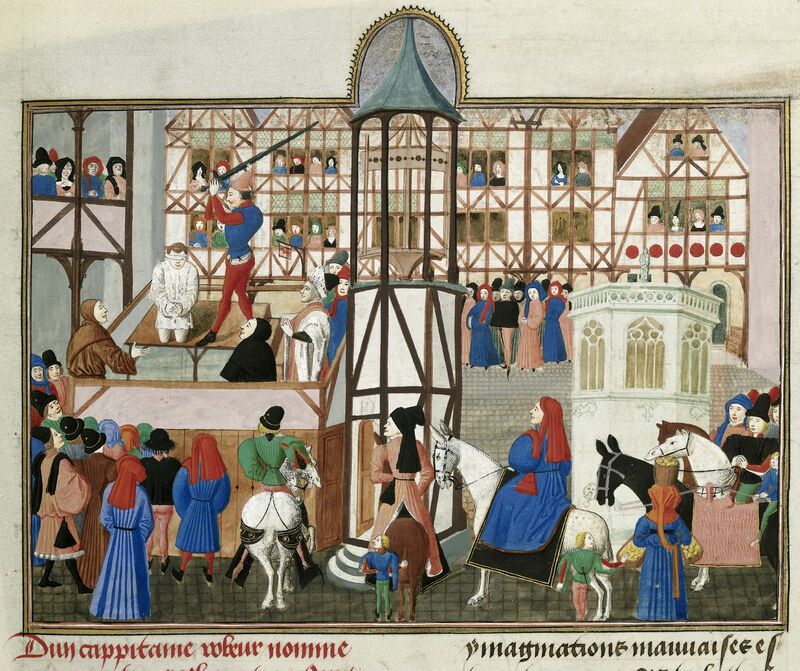 The manorial court decided the land boundaries and the days on which animals could graze in the fields. 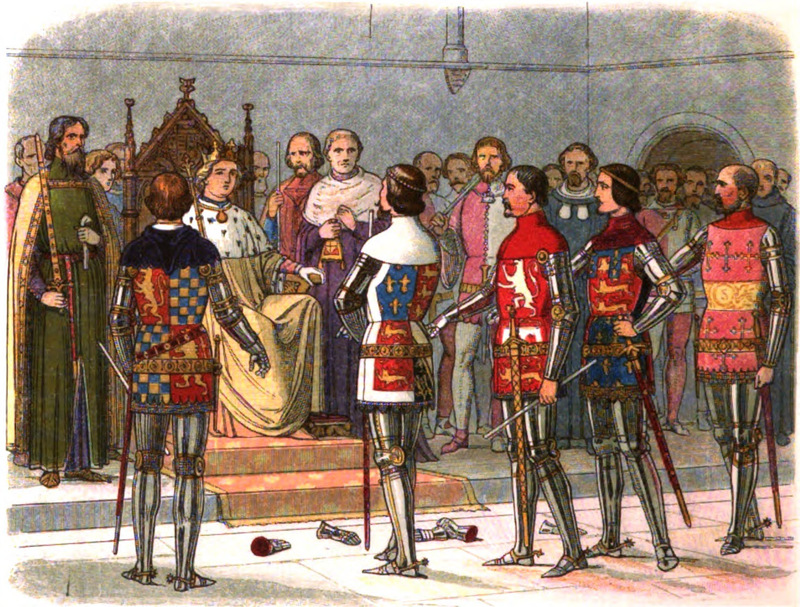 The steward presided over the court, but the village elected the officials from among themselves. The steward could not tell the court what to do and the court could appeal to the lord if necessary. Usually the business transacted by the court had no direct reference to the lord’s own affairs since it dealt with village problems such as loans not being repaid; men not turning out to work on the lord’s demesne; theft; the erection of a fence in the wrong place; or one villager injuring another. The court was run by the rich villeins who provided the jurors and officials. 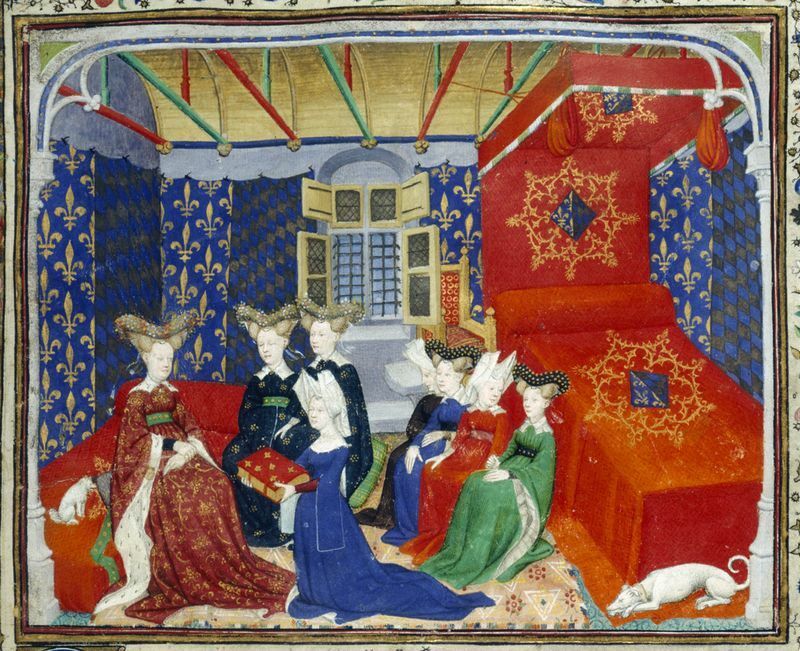 The court was supposed to meet every three weeks, but some met less often. All the serfs in the village had to attend. Those who did not were fined. The court was often held in the nave of the church, the part that ‘belonged’ to the village. There were not many places in the village large enough to hold the court and many were simply held in the open air, often in the churchyard. Some manorial courts met in the hall of the manor house itself. The jurors pronounced judgement on their fellow villagers (and occasionally on the lord) and this was sometimes put to the rest of the village as well for their assent. When making a judgement they had to take into account what they knew of the law, the customs of the manor and the manor’s bylaws. All the jurors and everyone else in the court knew both parties in every case that was brought before them, which was supposed to make it easier to come to a correct judgement. The system of justice was mostly based on the way in which society worked. People lived in small communities where everyone knew everyone else’s business and character. If you, as a villein, were asked whether your neighbour, Peter, had stolen from another neighbour, John, you would know the characters of both men and could assess whether John was making a false claim against Peter or whether Peter was a known thief. You did not have to have seen the (alleged) crime take place in order to be able to work out what had happened, nor did you need any evidence. Villagers had to pay a fee to the lord get their case heard. The lord of the manor benefited from any fines issued by the court and the court was often the source of a large part of the lord’s income. 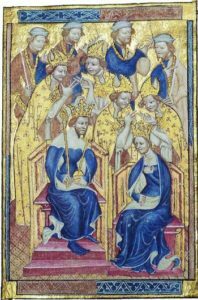 The manorial court also required payments to the lord on all kinds of occasions – death, inheritance and marriage all had their appropriate fee. When these things happened part of the lord’s land was transferred from one person to another and the fee was to obtain the lord’s permission for that transfer. 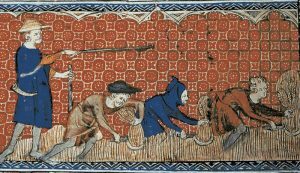 The court could generate a lot of income for the lord, and fines and fees tended to increase after the Black Death when there were fewer tenants to pay rents. The steward’s clerk recorded the cases and any fines or fees. As well as fines which went into the lord’s coffers, the court could also award damages to be paid by the guilty party in a case to the injured party. One of the commonest cases to come before a manorial court was the accusation that someone was selling ale before it had been tasted by the ale taster. Ale was brewed at home and sold to the neighbours, who came to the brewer’s house to drink it. The ale taster’s rôle was to ensure that a consistent quality and price were maintained. It is thanks to the surviving manor court rolls that so much is known about everyday life in the Middle Ages in England. What they show, however, is the things that went wrong and not the things that happened exactly as everybody thought they should. I’ve found that it’s easy to misjudge history, to confuse timelines from the relative luxury of the twenty-first century because we know the outcome of events in the nineteenth. When I started research for a series of books called the King’s Germans, I felt certain of both the timeline and the narrative. But research has that uncanny knack of unseating you. 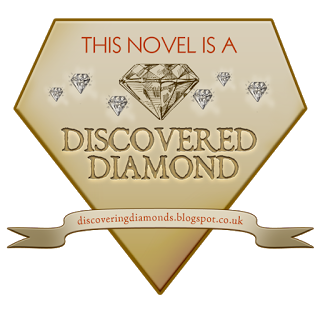 A story that flowered in 1808, was firmly planted in 1803. But the seed of the story was set in 1793. By 1808, Napoleon has conquered the major powers of Europe, except Russia and Great Britain. With the former, he has a treaty and a framework for co-operation, or at least non-aggression. With Great Britain, his intention is to turn the British blockade into a continental blockade of British trade. The French army numbers hundreds of thousands of men, with an array of experienced and highly capable leaders. And of course, Napoleon himself! So far, not too radical a narrative. But this is not the world of 1793. Then the fledgling republic that declares war on Great Britain and every other royal house in Europe is hardly united. It does have a large army, men forced into uniform by the Levée en masse. 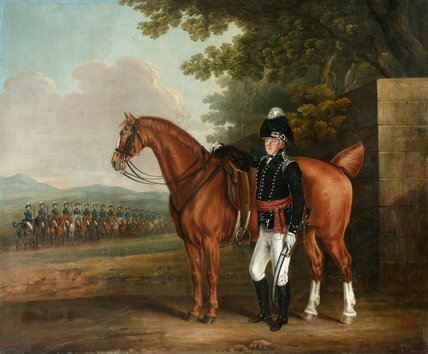 John Lynn (The Bayonets of the Republic) suggests that the volunteers of 1792 gave the French around 275 battalions, a field strength of 220,000. By February 1793, manpower is estimated between a paper-strength of 450,000 and worse case estimates of 290,000. But how does this affect Great Britain? Again, that firmly held conviction that I had before research was of the unquestioned superiority of the Royal Navy. As I sat and read Fortescue’s British Campaigns in Flanders, the narrative was rather different. The fleet was under tremendous strain, policing Great Britain’s global interest. Manpower was the most crippling deficiency, despite the greatest efforts of the press-gang. The influx of émigrés saw the formation of communities in Marylebone, Richmond and St. Pancras. The government’s response to the threat of spies and revolutionaries embedding themselves within London, was the Aliens Act, 1793. Immigrants had to provide their names, ranks, occupations, and addresses. Anyone who shared a room or house with an immigrant was also required to do likewise. Failure so to do was to risk being held without the prospect of bail and the possibility of deportation. The wider debates on the very essence of society and rights were popular and real arguments. 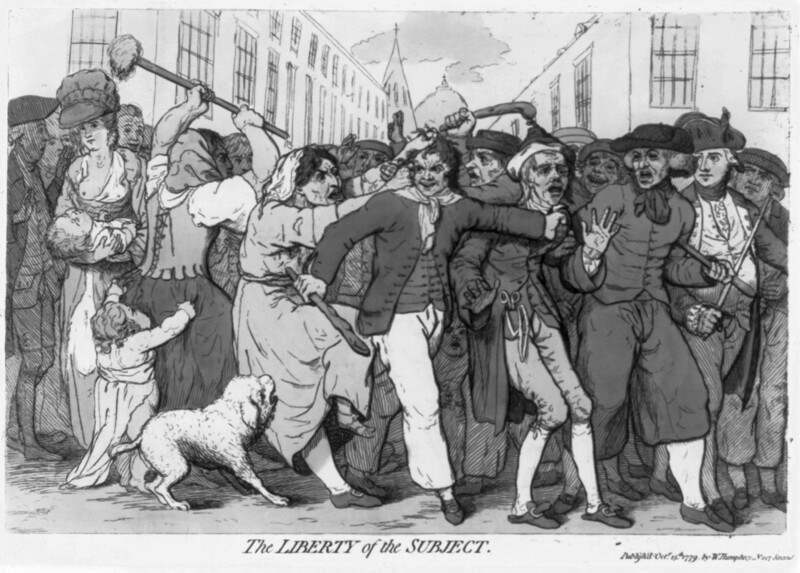 Edmund Burke had expressed the fears of the gentry in his essay Reflections on the revolution in France, an essentially conservative treatise condemning the revolutionaries. It sold well, with some 30,000 copies going into circulation. 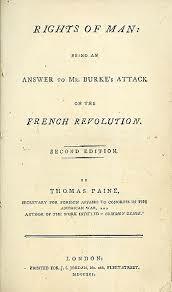 The rebuttal, by Thomas Paine, both defended the revolution and set out costings for welfare for the poor and the means to educate over one million children. At the time the population of the United Kingdom was estimated at around eight million. It’s also estimated that after the initial printing of the Rights of Man were withdrawn in February 1791. A new printing, in March of the same year, was estimated to have sold around a million copies. Paine was tried in his absence for sedition and sentenced to death by hanging. He declined the invitation to return from France and meet such a fate. How were the fear of invasion and the possible treachery from within were to be avoided? The answer was in the expansion of Fencible units, where the gentry were encouraged to raise infantry and cavalry formations, for the protection of the homeland. Life as a Fencible had certain advantages, a man was exempt from both the press-gang and drafting into the army. Thus, the estates of many landed estates were preserved of their workers and the sons of the nobility received military half-pay and pension safe from the prospect of ever been posted abroad. The ire that Fortescue directs to the obvious junket is worth reading. There was at least one case of an individual claiming a lieutenant’s half-pay for over sixty years. Nineteen thousand men were drafted into militia and Fencible units in 1793, according to Fortescue. The net result for an army destined for the continent was that only one brigade of two thousand men, drawn from the Foot Guards, was available for deployment. A second under Major-general Abercrombie was being prepared but these were so awful that the Adjutant-general wrote to the Duke of York and to Abercrombie to apologise. Such a letter shows the deep division between Horse Guards and Dundas, the War Minister. It exposes the fault lines over which the Duke of York was to attempt to exercise control of his army and a strategy to successfully conclude the war, with no firm indication of what such war aims might look like. In the war of the First Coalition, friend and foe know one simple truth: trust your ally at your own peril. May 1793: The French border. Valenciennes, Paris then home! Every common soldier knows the popular refrain so why can’t the commanders see sense? The protracted siege of Valenciennes exposes the mistrust between the allies. National interests triumph over military logic. The King’s Germans find themselves marching north to the coast, not east to Paris. Dunkirk has become a royal prize, an open secret smuggled to the French, who set a trap for the Duke of York’s army. 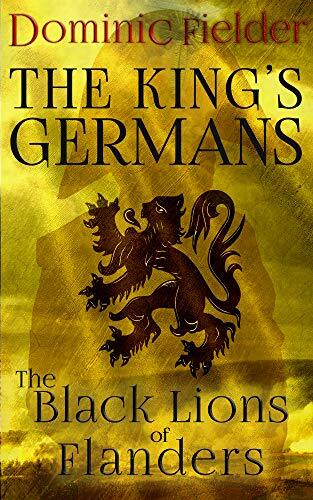 Lieutenant Erich von Bomm and Captain Werner Brandt find themselves in the thick of the action as the 14th Nationals, the Black Lions, seek their revenge. 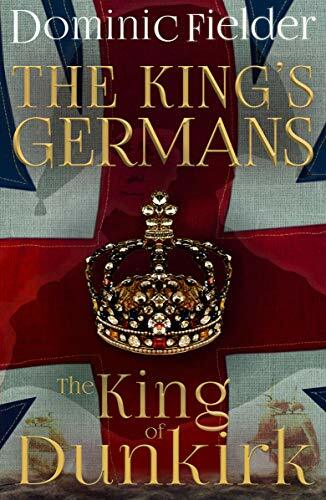 In the chaos of battle, Sebastian Krombach, working alongside Major Trevethan, the engineer tasked with capturing Dunkirk, must make a dreadful choice: to guide a battalion of Foot Guards to safety across the Great Moor or carry a message that might save the life of a friend. 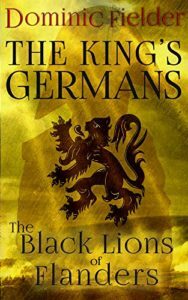 The King’s Germans and the Black Lions do battle to determine who shall be crowned the King of Dunkirk. Like many of us, I first learned of Richard II from Shakespeare. Even though I knew nothing about him, I was totally moved during the prison scene while he bemoaned the fate of kings—and I never recovered! But his story goes way beyond the events of this play; in fact, Shakespeare only covered the last year of Richard’s life. 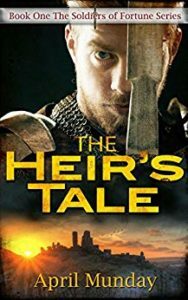 He tells us nothing about what led up to the famous scene between Bolingbroke and Mowbray, where their trial by combat was interrupted and they were sent into exile. 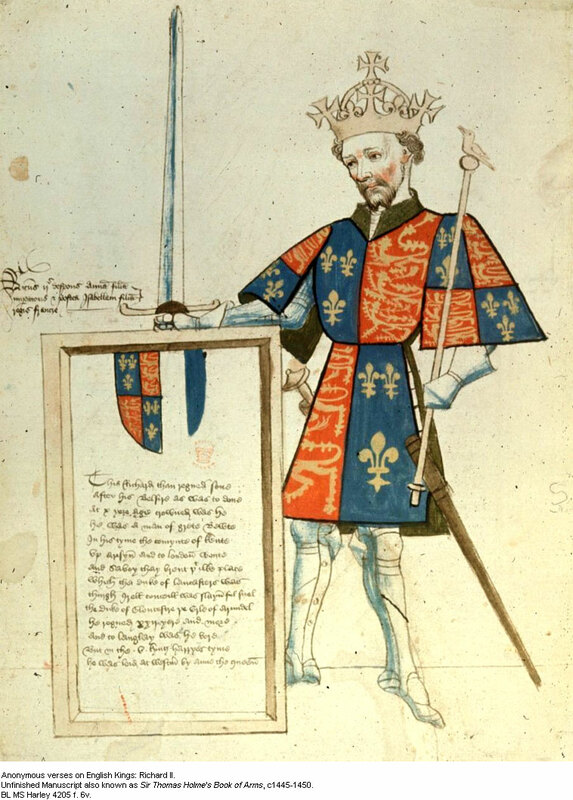 This was indeed the crisis that led to the king’s downfall, but Richard’s story is much more complicated than you would ever think from watching the play. First of all, did you realize that Henry of Bolingbroke was Richard’s first cousin? The clues are all there but it’s not easy to put them together. 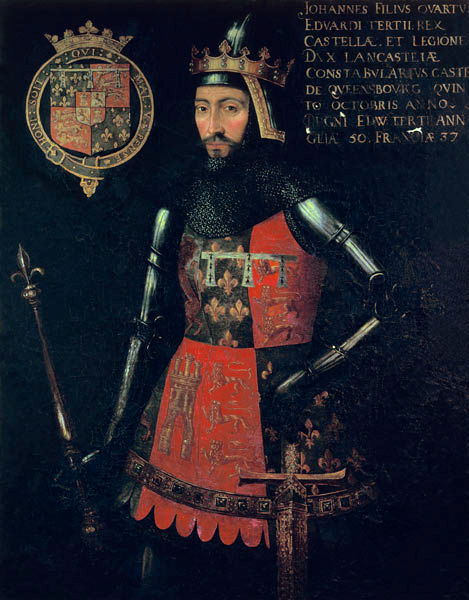 The old John of Gaunt (“This blessed plot, this earth, this realm, this England…”) was the eldest of Richard’s surviving uncles, and because Richard was childless he was next in line to the throne (debatable, but that’s another story). Bolingbroke, Gaunt’s eldest son, was next after him. This did not appeal to Richard; in fact, according to all reports, having Bolingbroke as his heir was anathema. Why? 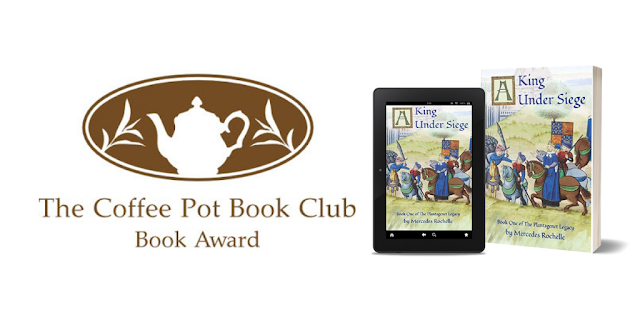 Events in my book, A KING UNDER SIEGE, will give you a good idea. 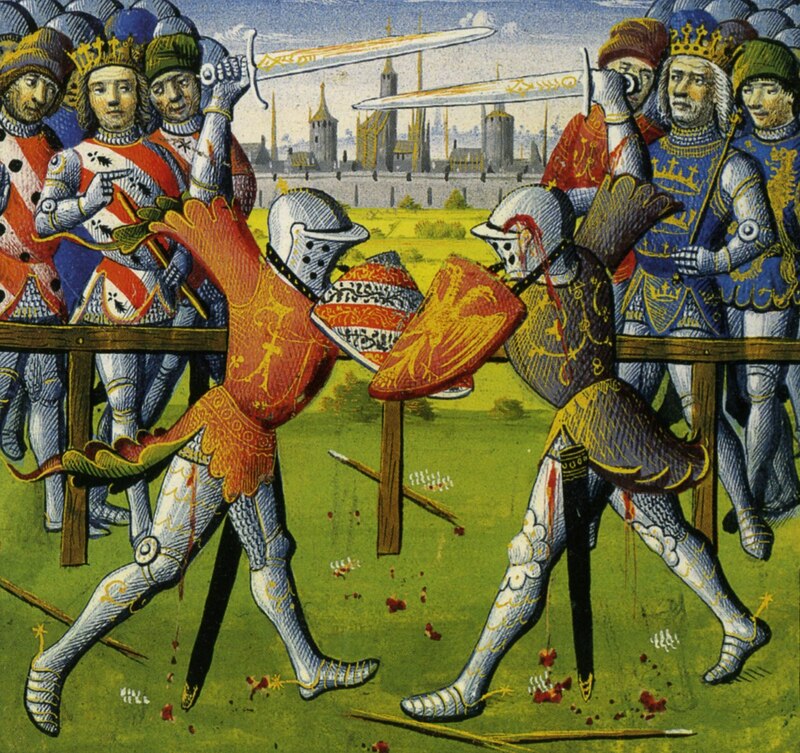 Richard and Henry were never friendly, but during the second crisis in Richard’s reign, Bolingbroke was one of the Lords Appellant—the five barons who drove the Merciless Parliament to murder the king’s loyal followers. Richard’s minority was not easy. The doddering Edward III was hardly a role model, and neither was his father, the ailing Black Prince who languished for years, disabled and debilitated. On Edward III’s death, Parliament insisted on Richard’s coronation instead of a regency; many feared that John of Gaunt would seize the throne. Nonetheless, what could one expect from a ten year-old? 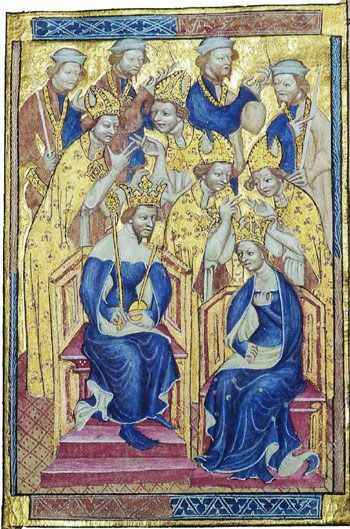 Four years later, the boy king proved himself worthy during the Peasants’ Revolt, but his subsequent attempts to assert himself led to conflict with his magnates. 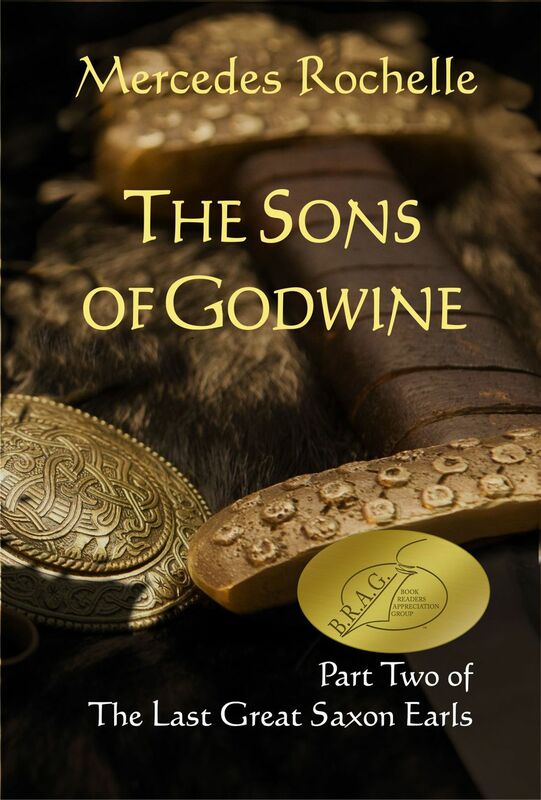 His bad temper, sharp tongue, and impetuous nature gave the restive barons plenty of excuses to hold him down. 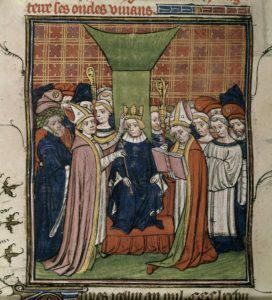 Richard’s solution was to surround himself with cooperative friends and advisors and exclude the self-righteous lords from his inner circle, which infuriated them. The king needed proper guidance, they insisted; his household needed purging. The Lords Appellant, as they came to be known, threatened Richard with abdication—humiliating him and destroying his power base. 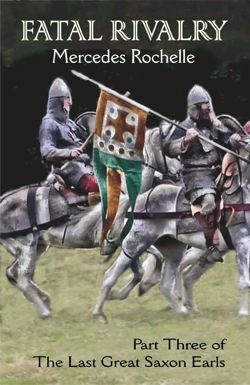 At first there were three of them: Richard’s uncle Thomas Duke of Gloucester, Thomas Beauchamp Earl of Warwick, and Richard FitzAlan Earl of Arundel. 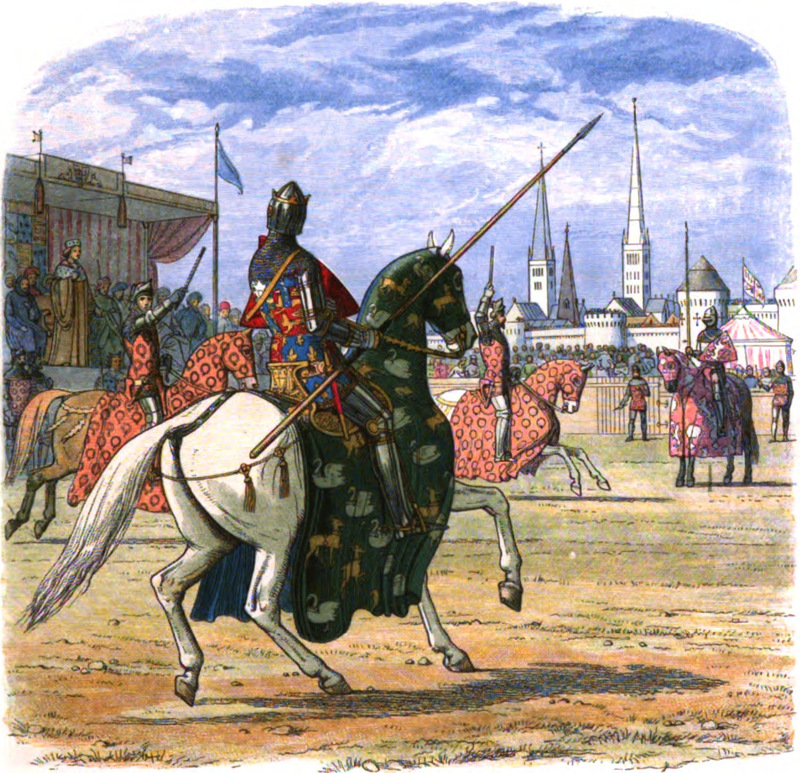 After Richard’s aborted attempt to raise an army in defense, Henry of Bolingbroke and Thomas Mowbray joined their ranks—the same who challenged each other in Shakespeare’s play. So you can see that Shakespeare’s trial by combat had a lot more going on than could easily be explained. Richard may have appeared detached while he observed the quarrel between Bolingbroke and Mowbray, but under his regal bearing he must have been shivering with glee. The altercation between these two knights was actually the result of their involvement in the Merciless Parliament. A year before the play took place, Richard had already succeeded in wreaking revenge on the original three Appellants. 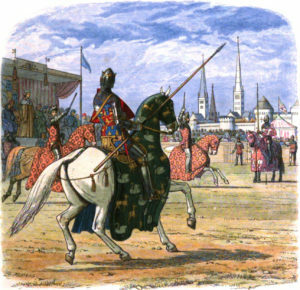 Mowbray feared that their turn was next, and when he voiced his concerns to Bolingbroke, the latter tried to save his skin by telling the king. The argument escalated from there, giving Richard the perfect opportunity to get rid of both of them. 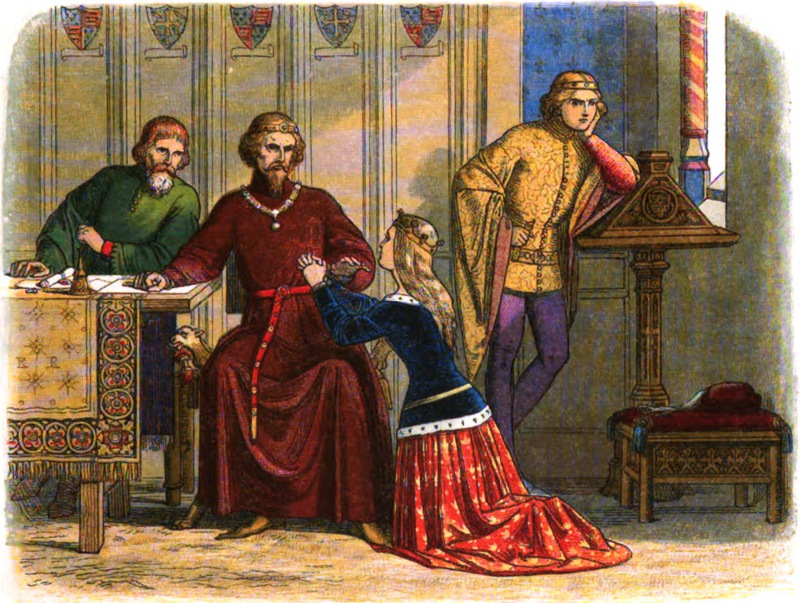 He made his fatal error when he went too far and deprived Bolingbroke of his inheritance. Shakespeare gave us the poignancy of Richard’s last days. Historians have left us more of a conundrum which may never be sorted out. Richard’s 22-year reign can be divided into two parts: the 12 years of his minority and the ten years of his majority—each of which are brought to a tragic climax. Hence, it will take two books to cover his story. As you might guess, volume two will be called THE KING’S RETRIBUTION. 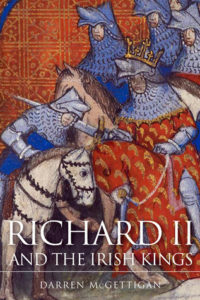 BOOK BLURB: Richard II found himself under siege not once, but twice in his minority. 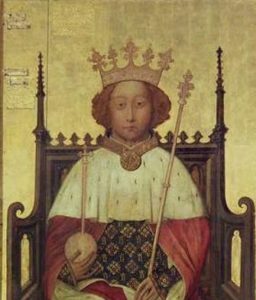 Crowned king at age ten, he was only fourteen when the Peasants’ Revolt terrorized London. But he proved himself every bit the Plantagenet successor, facing Wat Tyler and the rebels when all seemed lost. Alas, his triumph was short-lived, and for the next ten years he struggled to assert himself against his uncles and increasingly hostile nobles. 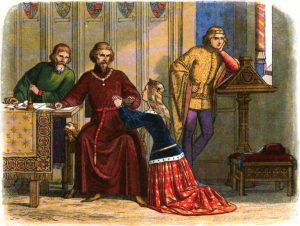 Just like in the days of his great-grandfather Edward II, vengeful magnates strove to separate him from his friends and advisors, and even threatened to depose him if he refused to do their bidding. 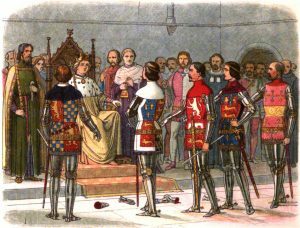 The Lords Appellant, as they came to be known, purged the royal household with the help of the Merciless Parliament. They murdered his closest allies, leaving the King alone and defenseless. He would never forget his humiliation at the hands of his subjects. Richard’s inability to protect his adherents would haunt him for the rest of his life, and he vowed that next time, retribution would be his. Richard II has proved to be one of the most enigmatic kings in the Middle Ages. Just like that other Richard (III, as we know him) his reputation was demolished by the person that usurped him. Historians are destined to muddle through documents that have been altered or written by hostile chroniclers. They must search for missing records and interpret passages written by survivors anxious to curry favor with the new king—or at least escape censure. It doesn’t help that there is such a wide range of conflicting opinions about him. Like many of us, I first learned about Richard II from Shakespeare. Even though I knew nothing about him, I was totally moved during the prison scene when he bemoaned the fate of kings—and I never recovered! But his story goes way beyond the events of this play; in fact, Shakespeare only covered the last year of Richard’s life. 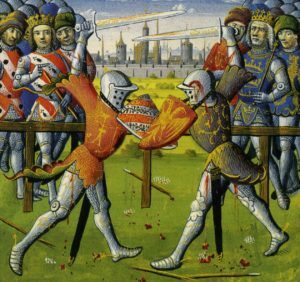 We know nothing about what led up to the famous scene between Bolingbroke and Mowbray, where their trial by combat was interrupted by the king and they were sent into exile. Once I did my research, I was astounded at how complicated Richard’s life really was. His 22-year reign can be divided up into two parts: the 12 years of his minority and the ten years of his majority—each of which are brought to a tragic climax. Hence, it will take me two books to cover his story. 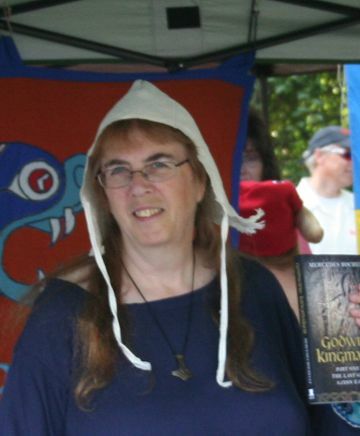 As you might guess from the book blurb, volume two will be called THE KING’S RETRIBUTION.